They Googled, they clicked, checked out our website and decided to get in touch with us. We were very happy to hear that Ordina wanted us to close their beautiful innovation event at the Nekkerhal in Mechelen. Little did we know that one of the main Ordina speakers was Tom Francis, who is not only the smartest guy we know, a man who understands AI better than the Terminator, but also family. We closed the day with an interactive keynote about how to inspire action and get people inside companies to start embracing innovation and technology. Transformation, digital, innovation is nothing without action, you will just have some smart people in a meeting room with a great idea. How do you get everybody excited, involved, so a small group of believers don’t have to do all the work, but they are able to ignite the fire across the entire company? A presentation we love to share. 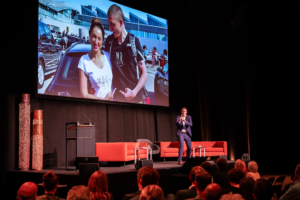 The event, catering and vibe was great, the day opened with a strong keynote from Rik Vera (Nexxworks) about the digital tsunami coming our way and how managers can prep themselves for the day after tomorrow. Following a strong panel discussion with industry leaders like Familiehulp, Proximus and Nike. We didn’t only share ideas and insights, we also got a lot of knowledge in return. Thank you again Ordina for having us and the audience for their motivating comments afterwards.